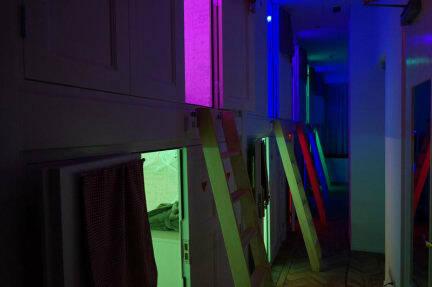 De Bedstee Boutique Capsule Hotel i Amsterdam, Nederland: Bestill nå! The Bedstee Hotel is designed for travellers like you, curious, social explorer, looking for memorable, shareable experiences. Discover the old Dutch farmer’s sleeping bedroom. The most romantic sleeping closet! Enjoy your private cabin with luxury bedding, flight cabin size luggage storage, mood led lights, mediapanel to charge your phone, private MIFI to be always connected in the city. When you’re done exploring, enjoy a drink or a snack at our bar; hipster cocktails, organic wines, local beers and unique coffee creations in our vegan and vegetarian organic bar. Its relaxed vibe makes it a cool place to meet new friends. We are situated in the most exclusive neighborhood of Amsterdam and located in an historical building in authentic 'Amsterdamse School' (Art Deco). The location is ideal, in the beautiful and quiet surroundings of the museum district where you can find the VanGogh Museum, RijksMuseum and the Museum of Modern Art, all located next to the Museumplein. The famous Vondelpark is just around the corner. For some exciting nightlife you can visit the Leidseplein, which is 10 min away! Cancellation policy: 72 hours before arrival. All the cancellations must be done by e-mail. We do not accept cancellations by phone. Check in from 15:00 to 23:00 . Check in after 23:30 pm are charged an extra fee of 40Euro. You are welcome to check in from 15.00 pm. We will do our best to try to check you in as soon as possible but if not, you are welcome to drop your luggage and start to explore the city until your bedstee get ready. We will ask you to check out at 11.00am. Are you feeling to sleep a little longer? Late check out can be booked for 35€ and until 15pm, when possible. In any case if you check out after 11 am , the late check out fee of 35€ will be automatically charged. 3 days before the check in we will ask you to settle the full amount of your bill. Unfortunately is not possible to pay later. Cash payments are not accepted. No-refundable bookings will be charged immediately. We are a smoke free property. Smoking is not permitted in the rooms or in any public area. Is strictly forbidden to smoke out of the windows or climb in the neighbors roof. If our staff catch you smoking, or if the fire alarm goes on, we will charge 300 €. You will be asked to leave immediately the property without any refund. You can smoke outside of the building and never if front of any window! Drugs are strictly forbidden inside the building and in the street of the building. We kindly ask to respect all the other guests. We have shared bathrooms for men and women. If a man is founded in the women bathroom, he will be asked to leave immediately the property. We offer lovely drinks, delicious snacks and food and you can enjoy them on our ground floor. We ask you to eat and drink in the bar/restaurant area and to do not bring any food/drinks upstairs. We do not allow your own consumption of food or drinks inside the bedstee or in the hallways. For security reason is not allowed to leave your luggage in the common areas.